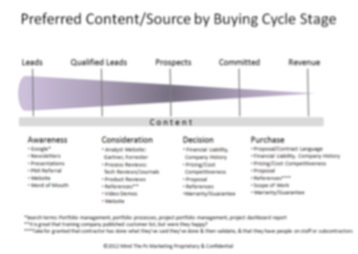 Buyers don’t want content. They want information. Information that makes them better, successful, and profitable … and basically, reach their goals. Buyers arrive at your content from different places. They come from different referral Websites. They work in different industries. They’re at different points in the purchasing cycle. As such, make sure to have content that is contextually relevant on multiple levels. Now more than ever, buyers are researching more information up front. You want to make sure you have the right information ready and accessible when they are ready. Marketing assets, such as newsletters and emails, are used to create awareness and interest. Blogs are helping to build a community. Marketing tools and assets are now generating awareness, interest, consideration, intent and evaluation! Clearly it’s important to get the right content in front of the buyer at the right time to ensure the buyer’s own prep work helps close the sale at an expedited pace. Ready to understand what your prospects and customers are looking for and when? Contact Mind The Ps Marketing today to get started on auditing existing assets and filling the gaps with meaningful content. We welcome you to share this site with a colleague.